It is not uncommon to have hundreds of songs laying idle on your iPhone or iPad, taking up precious storage space. In this post you will find the steps to delete songs in bulk (all songs) and also the steps to delete individual music albums and songs from your device. There are times when it becomes necessary to delete music files from your iPhone or iPad, either to recover storage space on your device or to get rid of scores of songs that you no longer listen to. Whatever may be the case, we are providing below the steps to delete All Songs, Albums and individual songs from your device. In general, music purchased from iTunes can be safely deleted, considering the fact that you should be able to re-download the deleted songs at any time from your iTunes account. However, iTunes errors cannot be entirely ruled out, it is quite possible for an odd deleted song to go missing from iTunes. Hence, it is recommended that you maintain a second backup of your Music collection. For this purpose you can make use of Google Play Music which allows you to upload up to 50,000 songs and play them across your iOS devices for free. 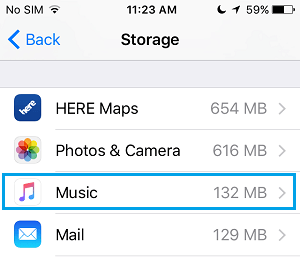 This method of deleting songs in bulk is particularly useful in case you have downloaded way too many songs to your device and now you want to tidy up things by deleting all the songs from your iPhone or iPad and make a fresh start to your on-device music collection. 1. From the home screen, tap on Settings. 3. Next, tap on Storage & iCloud Usage. 4. 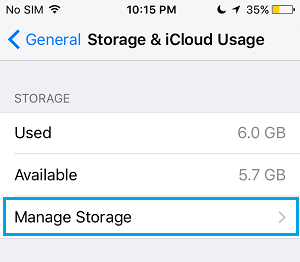 Now, tap on Manage storage located under the ‘Storage’ section. On the next screen, you will be able to see all the installed apps on your device with the storage space taken by each app. 5. From the list of apps, tap on the Music app (See image below). 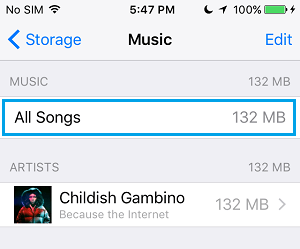 Once you tap on Music, you will be taken to the next screen where you will see the ‘All Songs’ section indicating the storage space taken up by all the songs stored on your device (See image below). Below ‘All songs’ you will see individual songs arranged by Artist. 7. Now, tap on the red colored Delete button (See image above). Note: Once you tap on Delete, all the songs stored on your device will be deleted, you will not get a pop-up warning. Instead of bulk deleting all the songs from your device, you may want to keep some music albums stored on your device, while getting rid of certain other music albums that you no longer listen to. 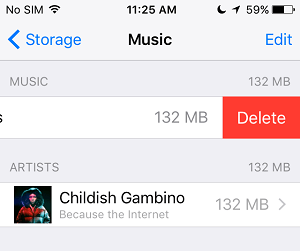 Follow the steps below to delete individual music albums from your iPhone or iPad. 1. Tap on the Music app on your iPhone or iPad. 2. From the bottom menu tap on My Music (See image below). 3. Tap on the Songs Link (See image below). 4. From the pop-up menu, tap on Albums (See image below). Selecting this option will change the display on My Music screen to be listed by Albums, making it easy to find and delete an entire album. 5. Find the album that you want to delete and tap on the 3-dot icon located to the right of that Album (See image below). The entire music album containing multiple songs will be deleted from your device. You can repeat this process with other music Albums that you may want to get rid of. Not all songs in a music album are worth listening to and you may want to trim down your music collection by deleting boring songs from an album while keeping those that you like listening to. Follow the steps below to delete individual songs from your iPhone or iPad. 1. Tap on the Music app on your iPhone. 3. On the My Music screen, tap on the Album containing the song or songs that you want to delete (See image below). This will open the next screen listing all the songs in that particular album. 4. Now, tap on the 3-dot icon, located to the right of the song that you want to delete (See image below). 5. Once you tap on the 3-dot icon, you will see a popup menu – tap on Delete. You can repeat this process to identify other songs that you no longer listen to and delete them from your iPhone or iPad.